How do astronomers weigh a star that's trillions of miles away and way too big to fit on a bathroom scale? In most cases they can't, although they can get a best estimate using computer models of stellar structure. New work by astrophysicist David Kipping says that in special cases, we can weigh a star directly. If the star has a planet, and that planet has a moon, and both of them cross in front of their star, then we can measure their sizes and orbits to learn about the star. "I often get asked how astronomers weigh stars. We've just added a new technique to our toolbox for that purpose," said Kipping, a predoctoral fellow at the Harvard-Smithsonian Center for Astrophysics. Astronomers have found more than 90 planets that cross in front of, or transit, their stars. By measuring the amount of starlight that's blocked, they can calculate how big the planet is relative to the star. But they can't know exactly how big the planet is unless they know the actual size of the star. Computer models give a very good estimate but in science, real measurements are best. Kipping realized that if a transiting planet has a moon big enough for us to see (by also blocking starlight), then the planet-moon-star system could be measured in a way that lets us calculate exactly how large and massive all three bodies are. "Basically, we measure the orbits of the planet around the star and the moon around the planet. Then through Kepler's Laws of Motion, it's possible to calculate the mass of the star," explained Kipping. The process isn't easy and requires several steps. By measuring how the star's light dims when planet and moon transit, astronomers learn three key numbers: 1) the orbital periods of the moon and planet, 2) the size of their orbits relative to the star, and 3) the size of planet and moon relative to the star. Plugging those numbers into Kepler's Third Law yields the density of the star and planet. Since density is mass divided by volume, the relative densities and relative sizes gives the relative masses. Finally, scientists measure the star's wobble due to the planet's gravitational tug, known as the radial velocity. Combining the measured velocity with the relative masses, they can calculate the mass of the star directly. "If there was no moon, this whole exercise would be impossible," stated Kipping. "No moon means we can't work out the density of the planet, so the whole thing grinds to a halt." Kipping hasn't put his method into practice yet, since no star is known to have both a planet and moon that transit. 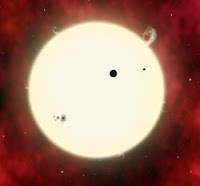 However, NASA's Kepler spacecraft should discover several such systems. "When they're found, we'll be ready to weigh them," said Kipping.